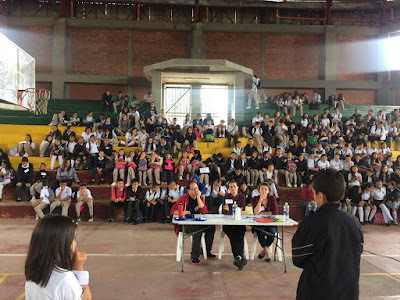 LIFE IN THE BAMBOO: COLOMBIARGH SURVIVAL GUIDE 2: TEACHING! Those of us here often joke that "It depends" is the unofficial motto of the programme and life here, as so many things are subject to change or unknown conditions that it's difficult to really rely on anything being 100% certain. HOWEVER! don't let that put you off - it all comes down to how well you can adapt/how open you are to adapting, which, if you're reading this because you're either headed here or thinking of applying, is probably quite likely. Anyway. Every school is different, so it's difficult to make a comprehensive/solid guide to teaching here, so consider this article more 'things to keep in mind' rather than 'things to expect', if you see what I mean. As with part one, if I receive or think of any amendments, I'll add them! These all apply to MEN (Ministry of Education - high school level) although there're probably a lot of similarities for those teaching SENA (college and adult level). A snapshot from my school's spelling bee, April 2017. A paro (teacher's strike) has recently ended, after being in effect for over a month. The only notice us Fellows received of this was a couple of days beforehand, with the information that "It might last a couple of days, it might last a couple of weeks." This is quite an extreme case, though - typical schedule changes involve the class timetable itself. At my school (INEM Jose Celestino Mutis), the class schedule has changed roughly every two - three weeks; before the strike, it ran from 7am - 4:30pm without a lunch break for teachers (students got one hour, but the teachers had to sit with them as they had their lunch and still try and teach a class - I know: that's nuts). My mentor did tell me recently that they expect to go back to a 7am - 4pm schedule, which does include a lunch break for teachers. Don't worry too much about being at school all day, though - this might happen once or even twice a week, but chances are you'll have a few periods free within that time. I'm really lucky because the Bamboo House is only a ten minute walk from INEM, so I can pop back home instead of hanging around for hours. Quick note: my students held a brief strike a few weeks ago, which was bewildering to me, coming from the UK where that sort of thing wouldn't happen. Kids formed a human barrier to prevent other students from reaching their classes, which brought everything to a grinding halt for a couple of days. Apparently, this isn't uncommon (the kids at INEM were protesting the "terrible canteen food"). These are kind of linked - you'll almost certainly have a separate staff room and staff canteen at your school, so make sure to show your face and say hello to your fellow teachers. Colombians appreciate people who make an effort to be friendly! My mentor made a good point a while ago: culture shock works both ways. Try to bear in mind that the way you're used to doing things/acting around work colleagues may be completely different to Colombians. An example of accepted behaviour: at the end of a lesson, as a matter of course I wait until my co-teacher says I can leave the class. Sometimes I have to hurry to another lesson, but if I do I make sure my co-teacher knows this is why I'm scooting off. Unacceptable behaviour: hurrying out of a lesson the instant it ends, without warning your co-teacher why. This is seen, at my school anyway, as rude and abrupt, as it gives the impression that you don't want to be around any longer than necessary. Maybe you don't for some reason, but try not to make it obvious! If you're coming here as a volunteer/co-teacher, I would suggest you try to remember you're coming into their classroom, and as such don't expect things to be done in a way you're used to, or even in a way that makes more sense to you. HOWEVER! most teachers here are really excited to gain a fresh perspective on teaching and welcome suggestions. And even those stuck in their ways (eg. I had a co-teacher who didn't want to co-plan) aren't necessarily 'awkward' (she was still open to ideas, and simply preferred to let me know at the start of a class what was in store). I think I'd be remiss not to note that, unfortunately, there have been instances where Fellows/co-teachers haven't got on. Sometimes, this is down to the Fellow not having the right attitude (eg. constantly complaining); sometimes it's down to the co-teacher being reluctant to adapt to working with another person. Try not to worry about this, though - it's inevitable that sometimes personalities clash, and chances are if you do find yourself in a similar situation, your mentor/regional coordinator [if you're on this programme] can help resolve any issues. Workspace: I was lucky enough to have my own desk and locker in the staff room (which I'm losing to a new teacher, unfortunately for me) which meant I always had space to store resources and work. I don't think many of my other Fellows were this lucky, so although there should always be space for you somewhere to work on activities, don't count on it being in the staff room. We're really lucky at INEM because we have a projector (known as a 'video beam' here) and computer rooms, with wifi recently installed in most classrooms. I believe we're the exception rather than the rule, though. If you have one, definitely bring a laptop with you - I worked with a Fellow who left theirs behind because they didn't think they'd need it, which as you can probably imagine made it very difficult to complete various tasks. I come from an arts/education background, so was surprised/disappointed to find that schools here don't have 'supplies' in the way I'm used to, ie. a room full of stuff to use. Instead, there are 'stores' onsite where teachers/students have to buy whatever they need, whether it's poster paper, pens or photocopies. Quick note: A4 isn't the default paper size here! I keep getting things printed out on sheets much bigger, despite providing the documents in A4 size. It's common for classes to average 40 students, so as you can probably imagine this makes classroom management rather tricky. During orientation, we were told about kids doing drugs in class, or setting fire to bins, but I haven't encountered anything like that at INEM, thank goodness. In my 'observation' week, I was appalled to see a young female teacher (who I've ended up working with the most, with 9th graders) completely lose control of a class, all thanks to one particularly unpleasant male student. He was moved to another class, though, and *touch wood* I've had no outright disrespect from any of my students. The general atmosphere in classes is 'organised chaos'. Students will wander about, talk loudly or shout at each other, maybe even have little scuffles or throw stationery about, BUT chances are they're still, incredibly, doing the work. Example: in one of my very first 9th grade classes, it became apparent that there was a group of five male students who were "troublemakers" - they seemed more content to chat among themselves or disrupt other groups YET they actually did a very high standard of work by the end of class. I've seen this sort of thing numerous times in the last few months, which meant I've had to alter my perceptions and management tactics accordingly. Female students (and some males) are also obsessed with preening and selfies, so don't be surprised if they get a make-up kit out mid-lesson! Ages are all over the place here, too. I have an 11th grade class with younger students in it than a 9th grade one! Generally, I teach students aged between 14 and 17. If you're headed to SENA, you'll end up with older teenagers through to young adults, possibly even older people. Students, like adults in Colombia, will think nothing about putting their arms around you or air-kissing your cheek (trying to, at least - I resolutely manage to avoid this sort of thing). Coming from my own background working with kids in schools and an art gallery, the local council stressed that we should never, ever engage in physical contact. This was tricky since I worked with little kids doing hands-on art activities and parties, and they think nothing about taking your hand or sitting right next to you to see what you're doing, so it becomes awkward trying to squirm away from them, when they can't figure out what's going on. In any case, Colombians have no such compunctions so it takes some getting used to! It's refreshingly innocent, to be perfectly honest. The language barrier! Now, I'm here to teach English, so as part of the programme we're not supposed to use any Spanish in school at all. However, and I guess I technically shouldn't be advertising this, it's almost impossible to do a decent job and not use some Spanish. Quite frankly, especially with younger students, you won't stand a cat in hell's chance of getting instructions or a point across if you don't use their language. Two very important caveats to this: only use Spanish as a last resort and don't advertise the fact you know Spanish if you can help it. If you come here with a decent level of fluency, I would suggest pretending you're not very good. The instant students realise you speak it well, they'll be tempted to default to Spanish - fine if you see them outside school, but obviously this becomes a problem inside the classroom. I'd like to make it clear my Spanish level isn't brilliant, but it's good enough to hold (halting) conversations with some students. Sometimes I have had to explain something in Spanish but I always make sure to either pro- or preceed these instructions with English ones. An important/interesting final thought on all of this: without a shadow of a doubt, it makes students feel more confident in using the English they know, when they hear me use what Spanish I know. 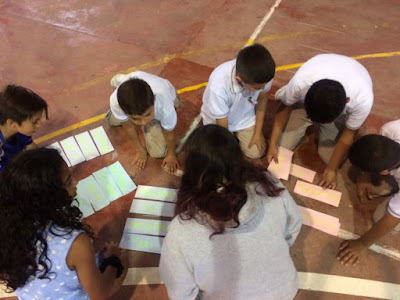 True, the co-teacher is there and they're supposed to help clarify, but you don't want to get in the habit of delivering a lengthy spiel only for the kids to wait for the teacher to translate back to Spanish for them. Simply put, there isn't time in lessons to go through this rigmarole every lesson. AMENDMENT: Just so I'm 1000000% clear: this is what works best for me and my students. If you can get through to your students purely by talking in English, without your co-teacher having to translate into Spanish, then that's fantastic. Going by my own experiences, and those of my friends here, I honestly think you might struggle (in Colombia; I'm obviously not talking about other non-English countries/speakers) but each school is different, like I clearly state at the start, so maybe you won't struggle, just like maybe you won't get a school with a totally nuts schedule. In any case, it's whatever works best for your students, since they're what this is all about. This is more of a sidenote, as it pertains exclusively to the Heart For Change programme [that's the recent batch of Fellows in the photo!]. There is quite a bit of paperwork to do, in terms of getting things signed by people at your school, and you almost certainly won't receive the relevant documentation until the last minute. Basically, if you're not in school for some reason (paro, half-term, etc) your school needs to 'approve' your absence. Don't forget you're here to teach, so although unexpected days off can be quite nice, if you're needed at school when you didn't think you'd have to be, it shouldn't be viewed as a disruption to your life (common sense, perhaps, but I've seen it happen). You also need to complete monthly reports (online), but these are pretty easy/quick. To be honest, the conclusion to this is basically the same as the conclusion to part one: be flexible. That's what it all comes down to. It can be very, very hard work but the rewards are 10000000000% worth it - I've already seen a marked improvement in my students in the last few months. You'll be a celebrity at your school so I heartily recommend you embrace the chance to share your culture. I love taking photos of nature and insects, so whenever I can I show pics from Australia to the kids and they're fascinated, whether it's of a sunny beach, venomous snake or weird-looking beetle. At the end of the day, you're here to improve their education (of English, other cultures), so as long as you keep that in mind you can't go far wrong!